Today is June 4th! Meaning we get to talk about Bobby Orr today! Most younger folks have probably seen him on TV commercials. Bobby has been featured in numerous autograph issues, hockey videos, memorabilia and even a commercial or two. Number 4 was a beast on the ice. He pioneered the notion of a puck moving defense-man. End to end he was a force on the ice and won the hearts of many folks. He probably helped generate a few cuss words of opposing players using his style of play. He could fight, he could hit and he could stick handle in a phone booth. He is the son Don Cherry wished he had. I am sure Don would have kissed the cheek of Orr before he kissed Gilmour. Haha! Unfortunately Orr never finished his career the way he wanted to. His career cut short by nagging knee injuries. He never quite resumed his prowess on the ice. There is a hockey card that features Bobby as a Black Hawk. Most fans of Orr refuse to admit this card exists. I had one in my display cases at one point and remember hearing a fan of his say that he couldn’t buy that card. It would be bring him sad memories. I can relate to that one some level. Picturing Wendel Clark in a Tampa Bay uniform just doesn’t feel right. 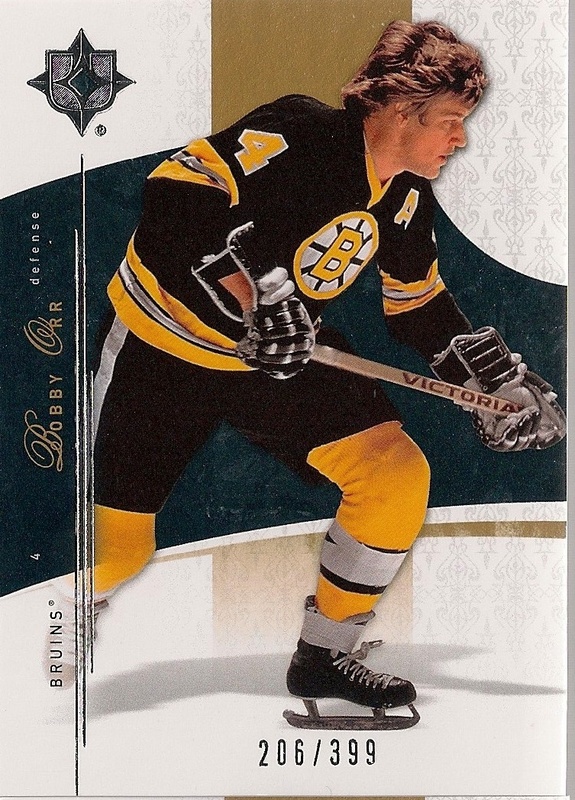 The neat thing I have noticed about Bobby Orr collectibles is that his autograph cards are still very much in demand. I wince with the notion of what would happen if Bobby were to stop signing all of a sudden. I am glad that I own a few Orr Auto’s. The neat thing is that Bobby Orr wasn’t the only Orr to suit up for the Bruins. Colton Orr also suited for the bruins. Mind you Colton is a true warrior but not exactly a puck moving skilled forward. Colton had good hands, but they were knockers, not puck-to-stick-toe-drag-fall-down-pass-to-winger-goal type of a player. I love Colton Orr, I wish he was back up with the big buds. Maybe next year. Oh ya, I was talking about Bobby, not Colton. Where was I? Bobby left hockey and started many a business venture. Most notably, he has created a pretty solid company in representing players. His family shares in this venture. Part of me is glad that Orr’s sons didn’t get into hockey. I couldn’t imagine trying to live in Daddies skates with millions of fans watching you. Wayne Gretzky’s seedlings are all to familiar with this pressure. Bobby, I have to thank you on behalf of my Dad. He is a long suffering Bruins fan. Thanks for giving my Dad some good memories of hockey when he moved to Canada. He fondly talks about you all the time. I swear you may have been neighbors. Haha!